Chase Boone Saunders is a former prosecutor, Chief District Court Judge, and retired North Carolina, general jurisdiction Superior Court Judge. He has a corporate, mediation and arbitration practice with the McNair Law Firm, P.A. Judge Saunders has mediated in excess of a thousand cases. He has arbitrated for the American Arbitration Association, private parties, and FINRA. He serves as a member of internationally-focused entities in the Charlotte region including The Global Vision Group, World Affairs Council, Charlotte Economics Club, Charlotte Rotary Club, and Chamber of Commerce. In 2014 he was recognized by the Charlotte World Trade Association for promoting global trade. He received the North Carolina Governor’s Order of the Long Leaf Pine for service to the state. 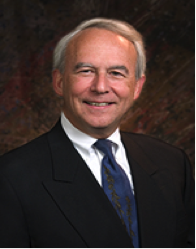 He holds an AV Pre-Eminent designation from Martindale Hubbell, a national attorney rating service. He is recognized by the Best Lawyers publication in the specialty of dispute resolution. Education includes both Bachelor of Arts and Juris Doctorate degrees from the University of North Carolina at Chapel Hill and an AA in accounting from CPCC. He is also a licensed real estate license broker.